For the past month, I have been hosting a weekly programming education Twitter chat on Tuesdays at 8pm EST called #KidsCanCode. Every week, there are new participants who are unsure about what a Twitter chat is or how to participate in one. So here is a quick guide to Twitter chats! Twitter chats are like an online party where groups of people with similar interests come together at a designated time to talk about a specified topic. Some chats occur weekly, some are bi-weekly such as #KidsCanCode, and others are monthly. It all depends on the moderators and the amount of participation. The chats take place using a common hashtag. Using a hashtag allows anyone on twitter to follow the conversation. It is like a key word that links tweets together. 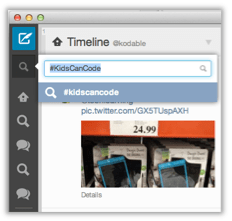 Here’s an example of what you might see when you click on the #KidsCanCode hashtag. All of these people used “#kidscancode” in their tweet, therefore Twitter lumps them together so you can read everything in one place. To participate in a Twitter chat you can use Twitter or some other Twitter software. I prefer to use TweetDeck or Hootsuite, because they allow you to open multiple columns. I usually keep one column open for the chat I am currently in, and one next to it with all of my interactions. I like this layout because I can see the chat while also seeing the separate conversations I have going on. You’ll find your own preferences as you get used to chatting on Twitter. 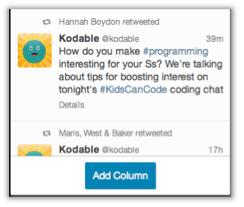 Once you install or create a free account on Hootsuite or TweetDeck, you need to create a column for the chat. In TweetDeck, you can do this from the side panel. Click the magnifying glass, and type in the hashtag for the chat you want to follow. For example, type in #KidsCanCode. When the chat comes up, click “Add Column” button at the bottom of the window and a #KidsCanCode column will appear. Now that you’re set up and ready to begin your first chat, it is important to know how they work. Twitter chats come in many different formats. Some chats are question and answer, others are focused on a guest, some are broken into conversation segments, and others are a free flowing conversation. 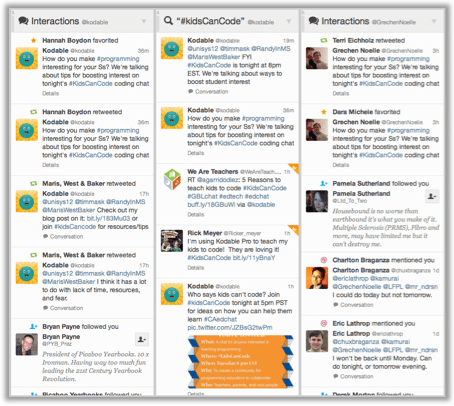 Most education related chats such as #KidsCanCode follow the Q and A format. I’ll go over participating in this format, since these are the ones I prefer and have the most experience doing. The moderator will have 5 or 6 questions prepared for the chat ahead of time. Every few minutes they will announce a question using one of the following formats. When you see the question, you can respond using “A” and the question number. It is important to include the hashtag at the end of each of your tweets so everyone can see it. Twitter chats are a lot of fun, especially when you find a group of people you really enjoy. Hang in there and try a few different chats to find a group you click with. Here is a list of all the education related chats that are available. Larger chats like #edchat and #edtechchat move very quickly, so don’t worry if you fall behind at first. Eventually you will get the hang of it. Now that you know all about Twitter chats, get out there, start tweeting, and join our #KidsCanCode chat!